The algorithm derives the patient-specific parameters for sensitivity to coumarins, their optimum dose, the time their bodies take to respond to dose changes and their inherent variability. These parameters are obtained by de-convoluting and fitting the patient’s own INR/dose history. Controlling the effects of prophylactic anti-coagulation is a serious medical issue with approximately 3 million patients in the US on trial and error dose adjustment regimes. Managing anticoagulation consumes vast amounts of clinic time, and hospital time when overdoses result in bleeding. The costs of venous thromboembolism to the US healthcare system are estimated as $15 – 34 billion annually (Thromb Haemost;108(2):291-302. (2012) PM:22739656). Per patient costs for those with a diagnosis of venous thromboembolism are estimated as $16,000 per year higher than those without this diagnosis (J Manag Care Pharm. 2012 Jun;18(5):363-74 PM:22663169). 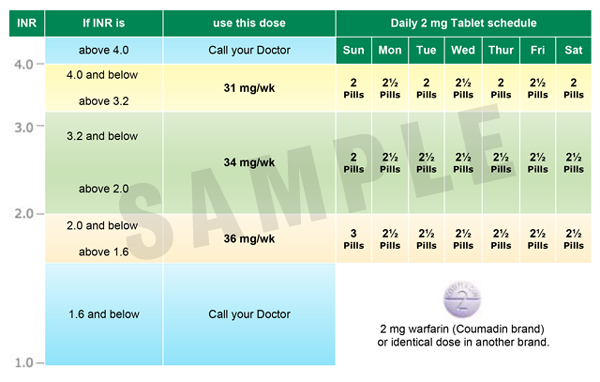 A new approach to warfarin dosing. Fearon Nomogram (patient-centered format) for Patient #23. 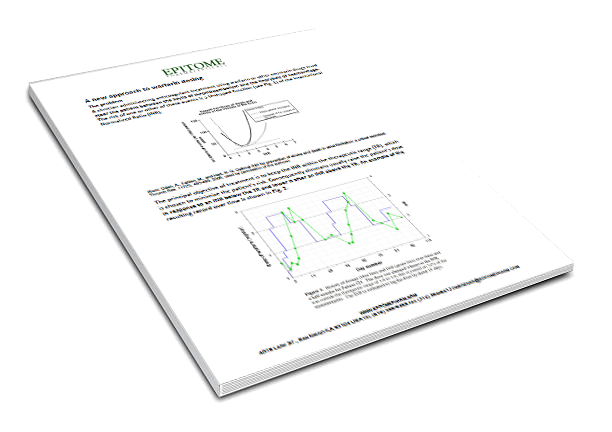 The Epitome system generates a patient-specific dosing nomogram. The nomogram displays the dose that will keep the patient within the optimal INR range, as well as high and low dose adjustment to return the patient to the optimal range. The INR measurement is naturally variable, so we recommend retesting an out-of-range INR before changing the dose. When the second INR reading continues to exceed the upper or lower ranges set in the nomogram, a doctor's intervention is necessary. Usually the INR only exceeds these bounds when the patient’s response to warfarin has shifted to a new regime due to a change in medical condition. In that case, a minimum of 4 INR/dose values from the new regime are required to produce a new nomogram. The sample nomogram here is for a patient with a therapeutic range of 2.0 to 3.0; their natural variability is too high to confine their INR to this narrow window. Should their medical condition change, their INR will shift and the nomogram provides a higher or lower dose accordingly; both of these doses are still predicted to result in an average INR within the therapeutic range. The doctor receives the clinical format of this nomogram with further details. Fearon Nomogram (clinical format) for Patient #23.